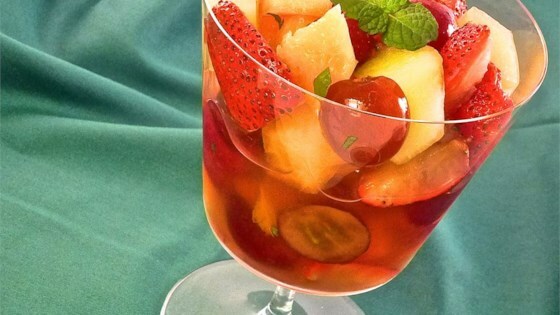 "This is a great recipe for whatever fresh fruit you may have on hand and a good cheap white wine. It's cool and refreshing and just complicated-looking enough to leave your guests wowed!" Combine the wine and sugar in a saucepan. Place the saucepan over medium heat and bring to a boil; stirring to dissolve sugar. Remove the saucepan from the heat and add the mint; set aside. Combine the cantaloupe, grapes, and strawberries in a large bowl. Pour the wine mixture over the fruit; toss together until all the fruit is covered with the wine mixture; cover and chill. Store in the refrigerator up to 8 hours before serving.